Does anybody remember these? Little cards that were inserted in the back of Look magazine back in the 60s? This first one shows a bust of Edison surrounded by some of his various inventions. 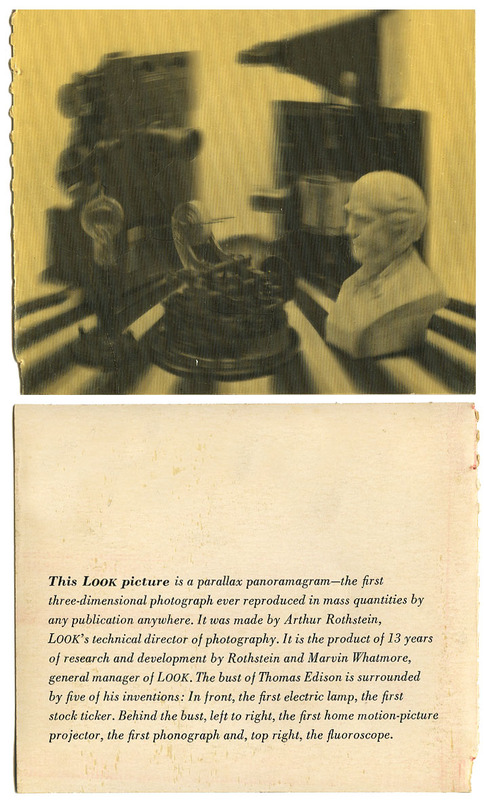 "A LOOK FIRST: 3-D PHOTO," proclaimed the message on the cover. The Parallax Panoramagram "may mark the beginning of a new era in graphic-arts," said the press release. As it turned out, Look's first ran almost last in the magazine. On page 105, just short of the back cover, persevering readers found a stiff, postcard-size appendage, attached in the manner of a subscription renewal card. On the card was a black and white picture that showed a bust of Thomas Alva Edison surround ed by some half-dozen of his inventions. What made most readers stop and look twice was the picture's distinct illusion of depth. Look's stunt, the result of 13 years' research, constitutes the latest effort to translate the real world of three dimensions into the picture world of two. Artists have employed trompe I'oeil three-dimensional techniques for centuries. But true success for photographers awaited the invention of the stereopticon camera in the 19th century, which took two pictures of the same subject through lenses that were separated like a pair of human eyes. When the viewer saw each picture separately, through separate lenses, his brain automatically supplied the missing dimension of depth. The Look process is almost identical. A specially designed camera takes pictures through a transparent screen that is serrated to break up the image into hair-thin vertical slices. The camera is then moved slightly to the right or left, as other, sliced-up pictures are taken on the same negative. The process is laborious, costly and slow, and not yet adaptable to highspeed printing. Merely to pose the static picture in last week's Look took two full days of work with a one-ton, cubical camera as complicated as an electronic computer. Five additional weeks were required to engrave the photograph, print it some 7,000,000 times on a sheet-fed offset press and then pour on and properly shape the clear plastic film that covers the picture with what amounts to a collection of lenses. The plastic lenses are so arranged that the viewer's left eye sees one of the serrated pictures, the right eye sees the other (see diagram). The poor things haven't actually aged very gracefully. They've yellowed and beneath the surface they have cracked into what looks like puzzle pieces. All still together and you can't really feel the cracks, but they're just below the surface of the plastic. I've always thought this second one especially odd. The woman posing in some sort of industrial plant. I'm just not getting it. I always think of one word...plastics. Here's an example of one labeled Xograph. If anyone knows anything about these I'd be happy to hear from you. Post a comment and let us all know. "Lenticular techniques showed rapid progress in the 1960's as large corporations recognized its advertising potential. 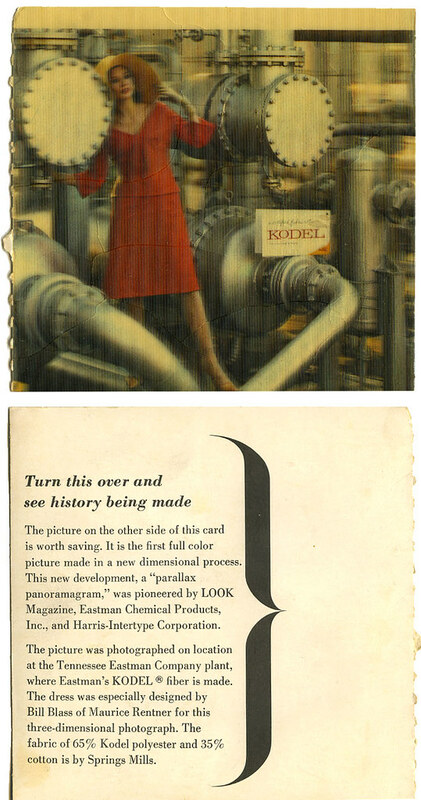 Mass production became a reality on February 15, 1964, when a Look Magazine issue featured the first ink-printed postcard sized "parallax panoramagram". The black and white still life of the bust of Thomas Edison surrounded by some of his more famous inventions required a 1000-pound camera, tracked in a programmed arc, to photograph. The manufacturing process involved printing the image using a 300 line offset press and a special technique for coating and lenticulating a thin layer of plastic on the image at high speed. The process, known as "Xograph" was developed at Eastman Kodak in Tennessee and was credited to Arthur Rothstein and Marvin Whatmore. Over 8 million copies were sold. Look Magazine followed with a color lenticular on April 7, 1964. With the growth in popularity of lenticular in the 1960's, several companies entered the market including Vari-Vue of New York, which was co-founded by Victor Anderson, who contributed greatly to the practical commercial success of the product. Vari-Vue, along with companies such as Crowle Communicatons, Hallmark, Toppan ("Top Stereo") and Dai-Nippon of Japan and later Optigraphics ("Optipan" and "Linearoptics") produced a wide variety of products over the next twenty years, including Cracker Jack premiums, Political buttons, 3D baseball cards, postcards, magazine and book covers and point-of-purchase displays. By the 1980's, as the novelty value of lenticular wore thin, the only significant manufacturer left in the US was Optigraphics who's success was largely the result of the continued expertise of Victor Anderson." I found your site when trying to do something special with all my fathers negatives, black and white photos and slides that he has collected from his travels as a photographer for Look and Venture magazines. i was excited to see his 3 d photos on your site. Our family has albums of the 3 d pictures. I also watched my dad shoot many 3d pictures at the look magazine building on madison ave in nyc. Then the studio in Arlington, texas. He would create a shadow box for some pictures where he would cut out the models or items they were advertising. The camera was very large and it would move slowly to shoot a blurred image and then my father would design a plastic coating to give the photo the 3d effect. I have a very large mac tonight picture he did for Mc donalds hamburger in the late 60's or early 70' My fathers boss and a friend was Arthur Rothstein. They worked for look and venture until spring of 1973. Victor Anderson was one of the men at opticgraphics. I remember the first two in the magazine and kept them probably because they looked cool. Blurry, but cool. I have no idea where I got the third one. I know we did not have a subscription to this travel magazine so I wonder if they indeed went to all the trouble to put these things on their cover and if so was it cost effective? I'm thinking probably not. I don't remember the cards in Look, or any other manifestations of this process. The pictures make me feel a little queasy. But scientists can't seem to resist inventing a way to show three dimensions within two, so they'll probably do convincingly someday. I wonder what happened to the Kodel fabric line. At some point I'll scan some of the other postcards I bought. They were not quite as blurry as these original cards that were in LOOK. The process was improved, but still never looked quite right. You could take and bend the cards a wee bit and things would appear to move. I have a couple cards of ships that looked like they were moving, the birds flying. As to Kodel, I don't know. I remember having clothes with Kodel tags on them in the 70s. Slacks that kept a crease...forever. Jackets that didn't wrinkle. It was a step up from most of the polyester that was on the market. I don't remember Kodel getting the nubbies that regular polyester got. It appeared a bit more like cotton. Perhaps someone else will have better memories of it. Anonymous, glad to know I'm not the only person out there with these oddities. Would like to see images of these. I've done extensive research into the history of 3d imaging and have hundreds of pages of notes on the various inventors and organizations who played in this milieu over the years as well as hundreds of historic examples. For the record, Visual Panographics existed between 1964-1973, it was a division of Cowles Media, a vast publishing empire of newspapers and magazines, they published Venture as well as Look. Anonymous has never written back so don't expect to hear from him/her. I did hear from a person whose father was one of the photographers who took some of these shots and I'm waiting to hear back from her. If you ever post them on a site please send me the url so I can post a link directly in the post. I'd sure like to see them! And I'm sure when others eventually find this post, and surprisingly others have, it would be great to give them a direct link. I've got the second one with the red lady for sale. If somebody is searching for it, feel free to contact me at tom@vwkaefer.net. Doesn't have to be expensive. Thank you! You've created a wonderful place to view all things 3D in photography. Fascinating! Greetings! I'm currently researching an internal memo from Disneyland in 1966... as they discuss the scheduling of Look photographers to take a series of 3D photos that would ultimately be produced as souvenir postcards. The Look photographers / crew assigned to the project included: Mr. Drago (assumed to be Victor Drago); Mr. Cosgrove; Mr. Feldman (possibly Dennis Feldman? ); and Mr. Benanti (John Benanti). The memo mentions that the camera had to be moved from a truck with a forklift... and moved to four different locations throughout Disneyland. It'll be great to hear if anyone else can confirm the other photographers on the shoot. All I can say is keep your fingers crossed someone else finds this post. It sounds like an interesting project. Good luck. Debbie Thorne, is also my sister in the above replies. My Uncle worked as an Artist for Look at the time these were made. His name was Denton Morris and every time I see a 3D postcard it reminds me of him. Thanks for all the information I found it fascinating. Glad you found the post and found it useful. Thanks. We're lucky we aren't MORE NEUROTIC! Wouldn't you like to own a STUDEBAKER?